Content marketing is here to stay and the good news is it's a damned sight more reliable than firing out endless press releases to indifferent journos, in the hope one sticks. Mainstream journalism has always skirted at the seamier edges of life. The dumbing down of the national press by agenda-driven media barons has seen an ever-increasing slew of scandal and sleaze clogging the front pages of low-rent publications. Anybody tuning into the current Leveson enquiry will see just how far the press has fallen in their pursuit of the next salacious headline, as journalism's murky underbelly is exposed for all to see. The tide has turned though. The old model is on its way out, as traditional journalism has failed spectacularly in keeping abreast of the changes that have taken place over the last five or so years. Circulation is down and those who once dictated the rules are now against the ropes; bruised, battered and desperate to land one last punch before they hit the canvas. Journalism is dead! 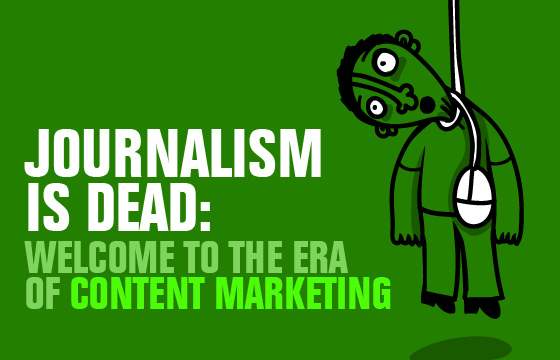 Welcome to the era of content marketing. The internet, apps, social media and blogs have dramatically changed the way in which we search for, access and interact with information. Unless you're a retired Colonel with a handlebar moustache, flagpole on the front lawn and a morbid fear of "those damned subversive interweb rotters", the chances are you regularly – if not primarily – use the internet as a source of information. You're doing it right now. Content marketing enables you to harness the power of the World Wide Web and attract potential customers, as opposed to beating uninterested parties half senseless with a heavy sell that only breeds animosity. You are no longer tied to the old advertising model to generate your leads. Content marketing allows you to be your own journalist, PR and mouthpiece. It gives you the freedom to shout from a digital rooftop how great your offering is, without having to go down the costly road of press release publication. Social media is a wonderful way to spread your message and you're not restricted to the big hitters like Twitter and Facebook. There are myriad communities and channels threaded across the internet where your message can be heard by the people who want to hear it. But surely it's just a passing fad. Really? Old media has failed to keep up. They've had their time – they've even tried strong-arming control back into their hands. Murdoch's cynical acquisition of MySpace for instance, largely regarded as ushering in the demise of that particular network. Likewise, Twitter is now considered by some to be the only resource for breaking news. It provides on the ground, real time reportage that traditional media outlets can only monitor (along with other social media platforms) to inform their own news feeds. A fad? You really think a cost-effective Do It Yourself approach, where you can corner your own particular niche in the market is a fad? So long as you have a strategy in place for the creation and deployment of your content, which should be both engaging and informative, there's no reason why you should ever look back. Journalism is dead. Who needs it? With content marketing YOU are the journalist. To find out more about how marketing is changing, download our eGuide, 'The End of Outbound Marketing as We Know It: Why You Will Be Able to Market Yourself in 2013'.